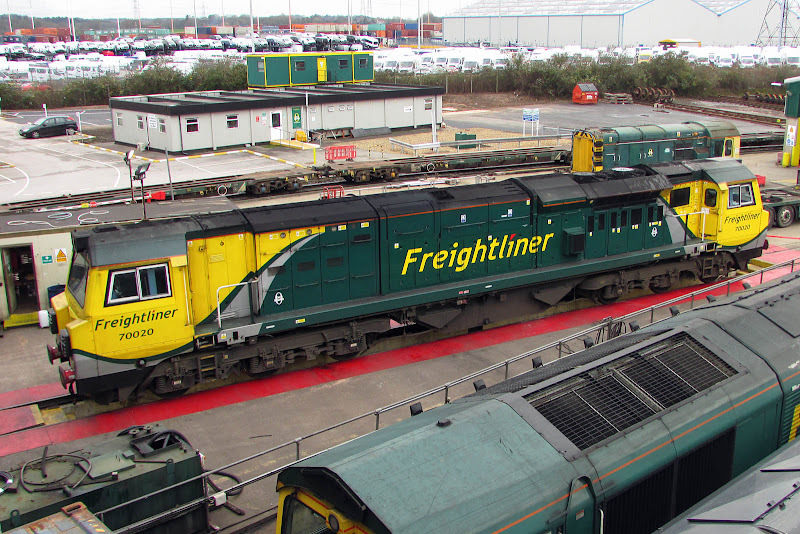 Vossloh Kiepe are to start to install new traction packages in the Class 455 emu's at Eastleigh depot from January 2016, with plenty of new signage on the building. 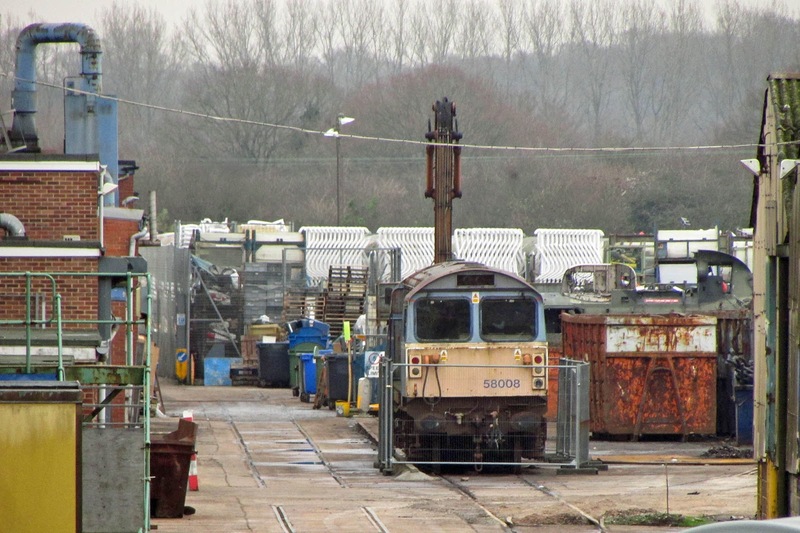 5870 is present at the depot, no doubt related to the programme, as it was the second conversion, already performed at Wimbledon, and may still be on test. 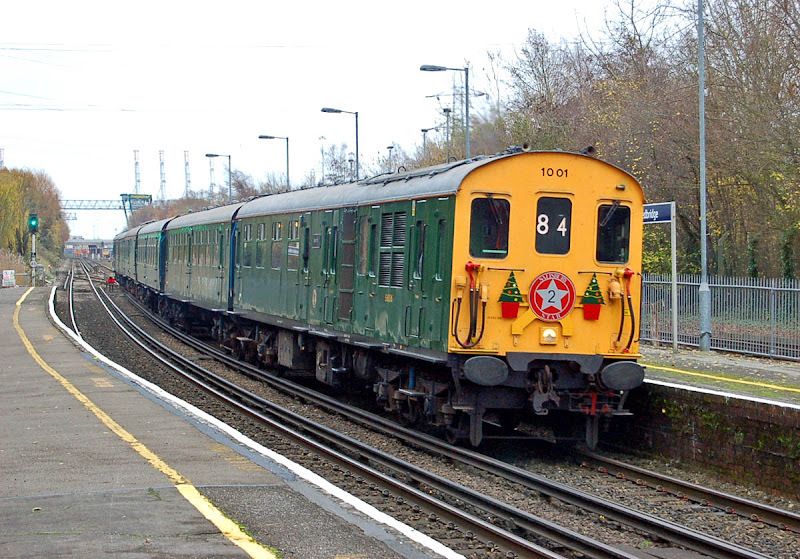 Some Class 455s have traction motors which previously ran under Class 405 4-SUB units, and are over 60 years old. This scene seems rather 1970's, rather than the present day. 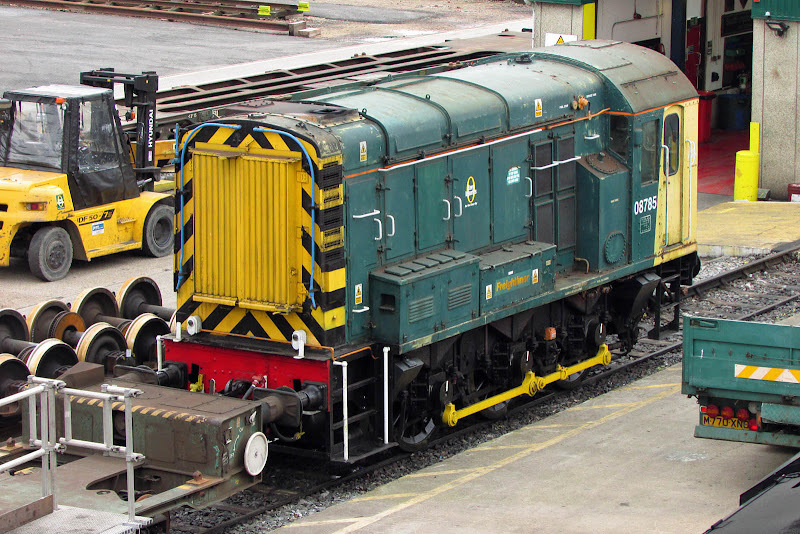 07007 is back in use at Eastleigh, following its recent repairs, and is seen shunting Dogfish DB993345 (Metro-Cammell, Lot No. 2823, 1957), with a load of ballast. 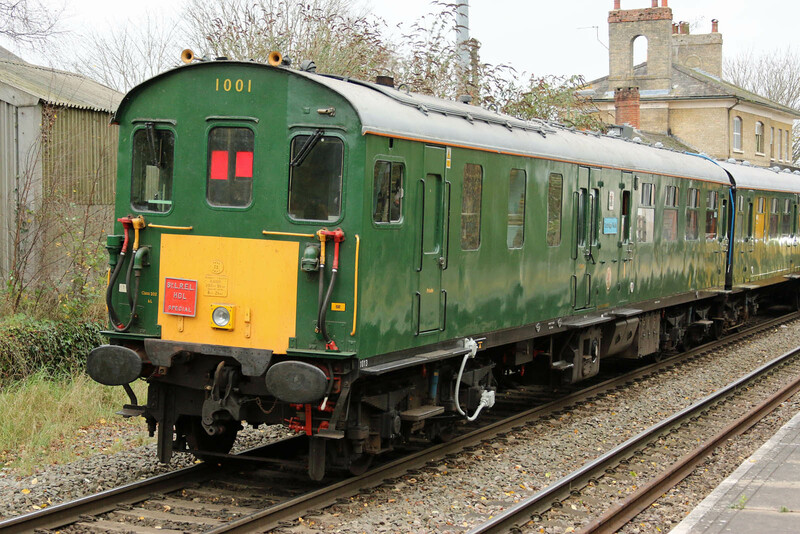 This does deserve a double take as you have not seen these out and about since 2006, this example was at the Watercress Line, but has been at the Works since 2014. 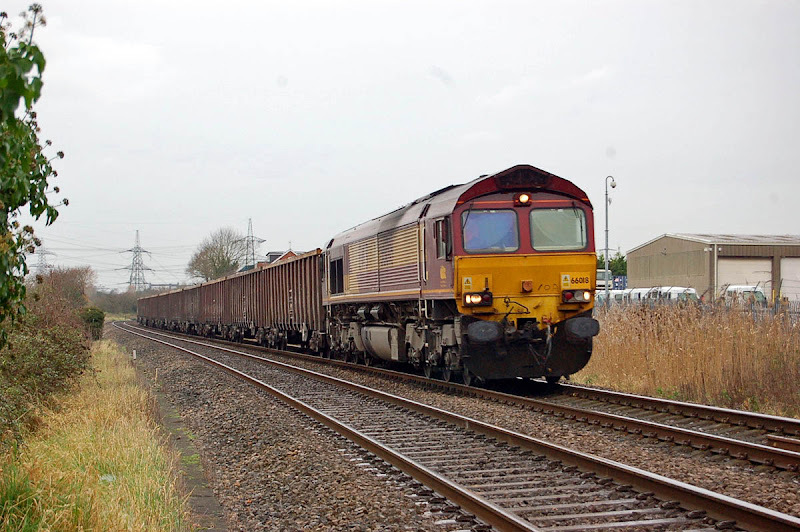 The line up is 66752 The Hoosier State, 66742 BAP Port of Immingham Centenary, 70801,70804 and 70014 departing with 4O27 05:21 Garston - Maritime. 70810 in far distance on the Works. 66018 at Nursling with 6Z16 02:00 Dowlow Briggs Sidings - Southampton Up Yard. Image by Ian Knight. 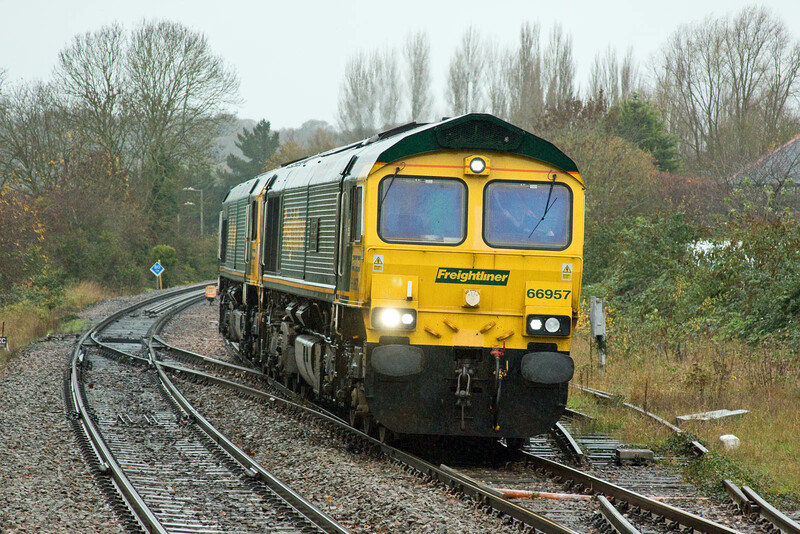 58008 has been moved from Eastleigh Depot to the Works on 17th, transfer taking place by road! A whole album covers this. 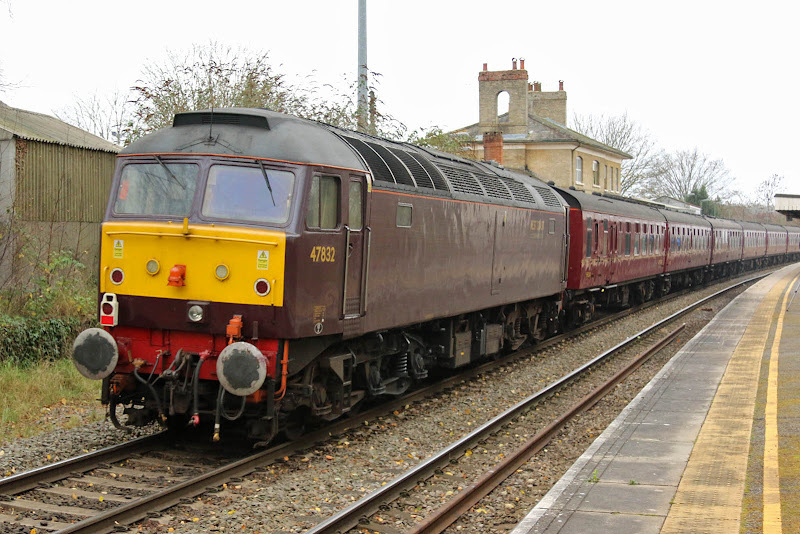 Rumours suggest that all of the remaining DRS Class 47 fleet may be sold to Jeremy Hosking. 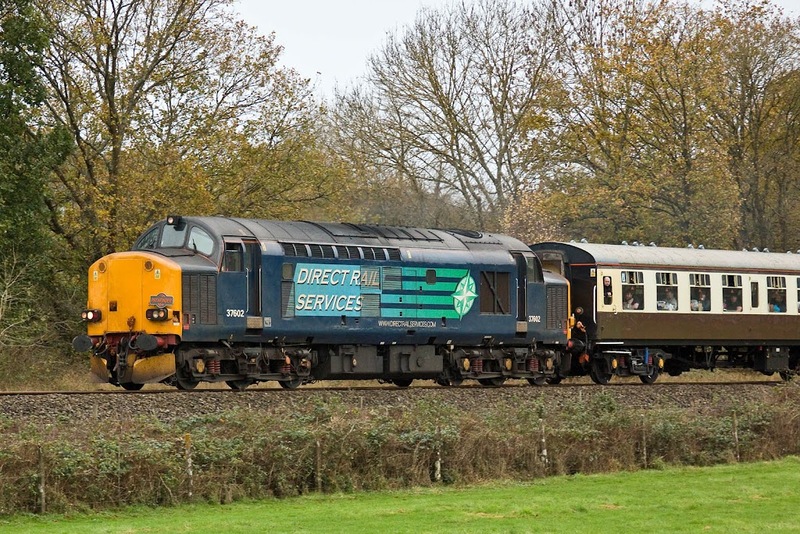 2015 is likely to bring significant change to the DRS 47 fleet, with the influx of Class 68, and Norwich backup services being transferred to Class 37/4. 17th September: 47813 stored. 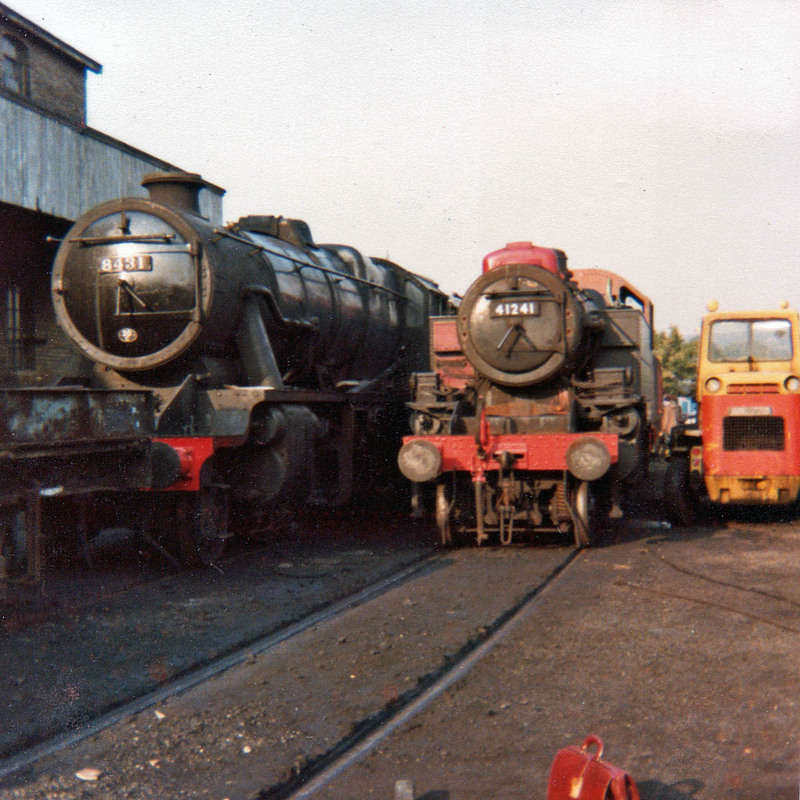 Back to three available locos. 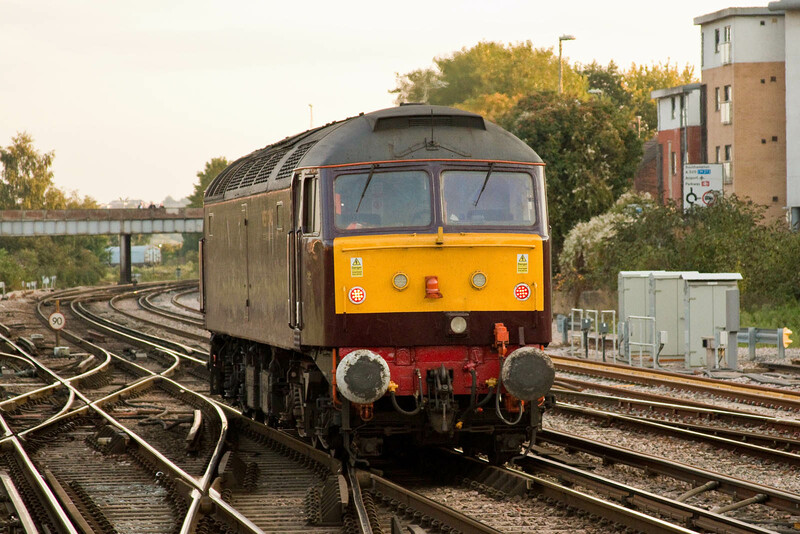 2nd October: 47790 reinstated after bogie swap with 47841 at Eastleigh. 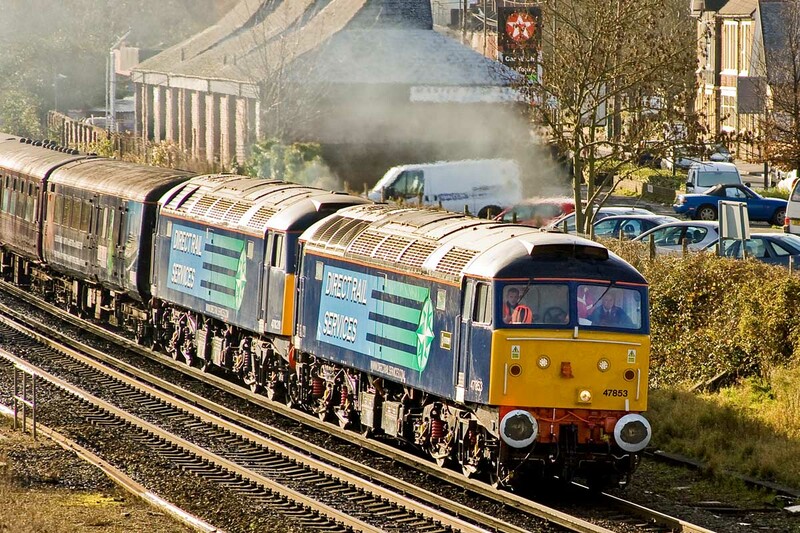 Four locos available going into RHTT season. 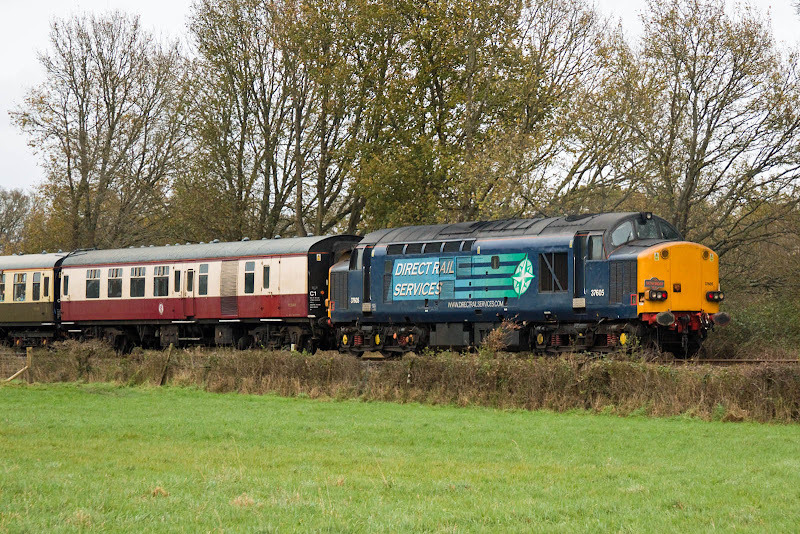 15th November: 47805 and 47818 into storage at Kingmoor. 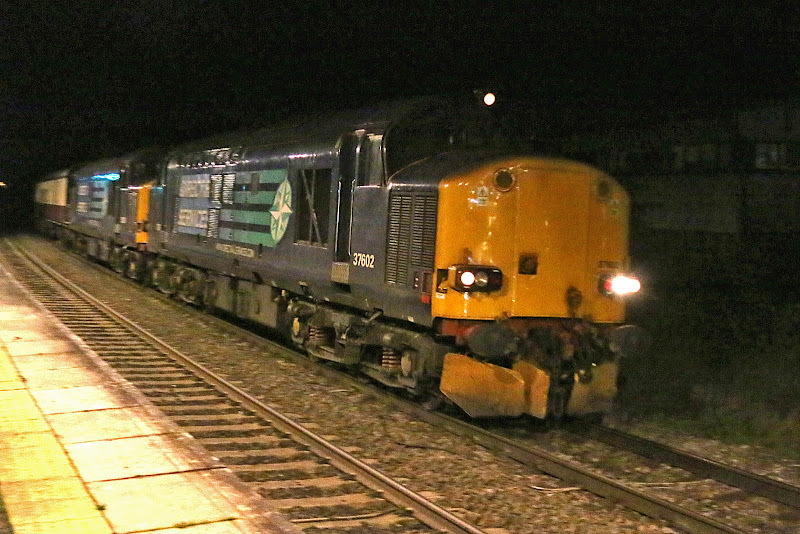 47790 out of traffic for repairs at Crewe, leaving 47828 in traffic on RHTT duties at Stowmarket. 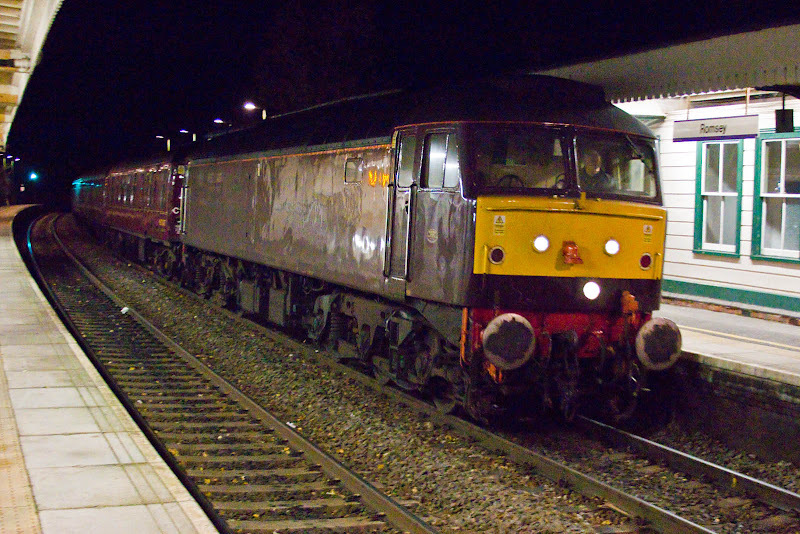 15th December: 47790 stored at Crewe. DRS Class 47 era is over. 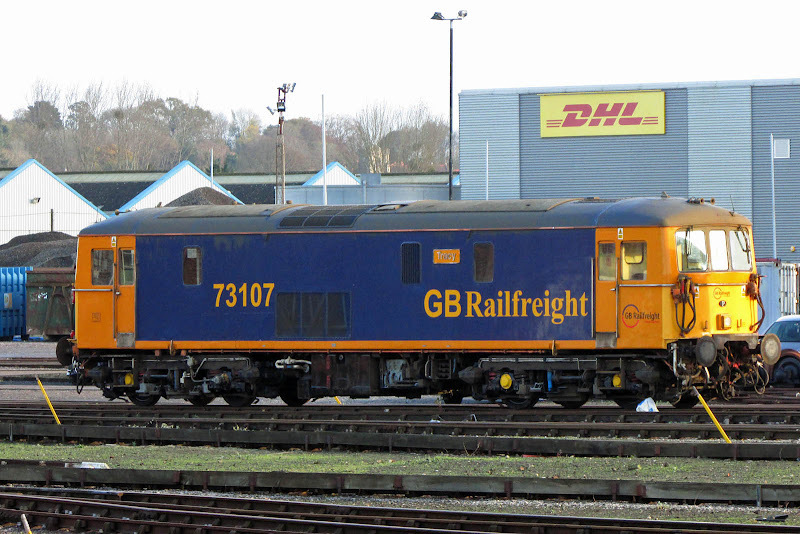 70020 at Maritime, 13th December. 08785, originally delivered as D3953 from BR Derby on 23rd April 1960, and allocated to 81A Old Oak Common. 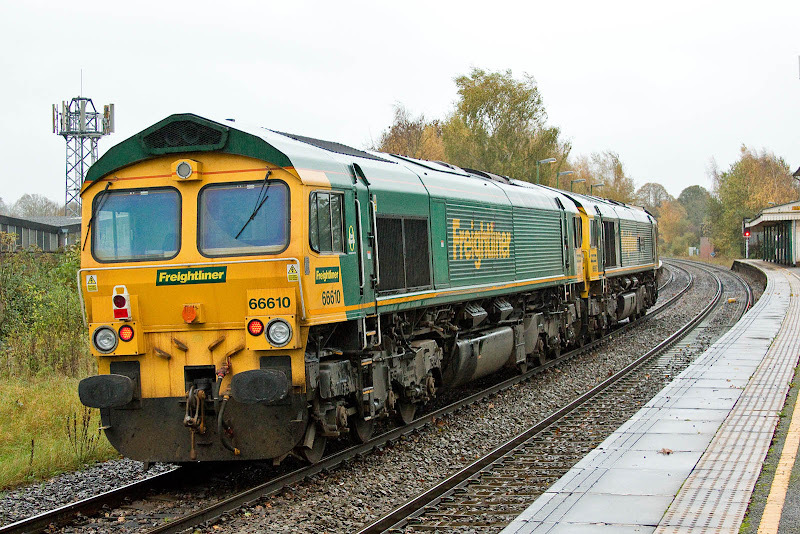 66530 has been reallocated from pool DFHH (Freightliner Class 66 Heavy Haul) to pool DFEP (Freightliner Class 66 Poland). 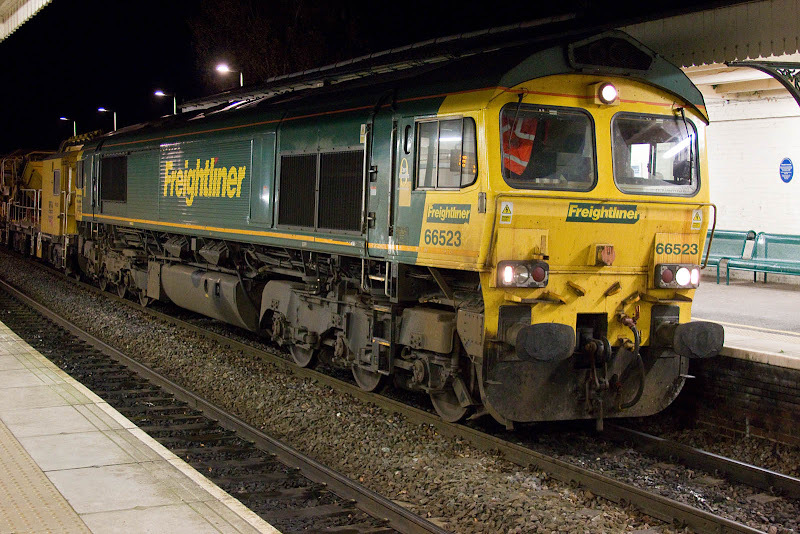 On 12th December 2009 it was hauling a diverted 4O29 Crewe Basford Hall - Maritime through Romsey, at which time I believe it was in pool DFGM (Freightliner Class 66 Intermodal). The locomotive, GM EMD builders number 20008269-5 was delivered in July 2001. The press release from ORR. 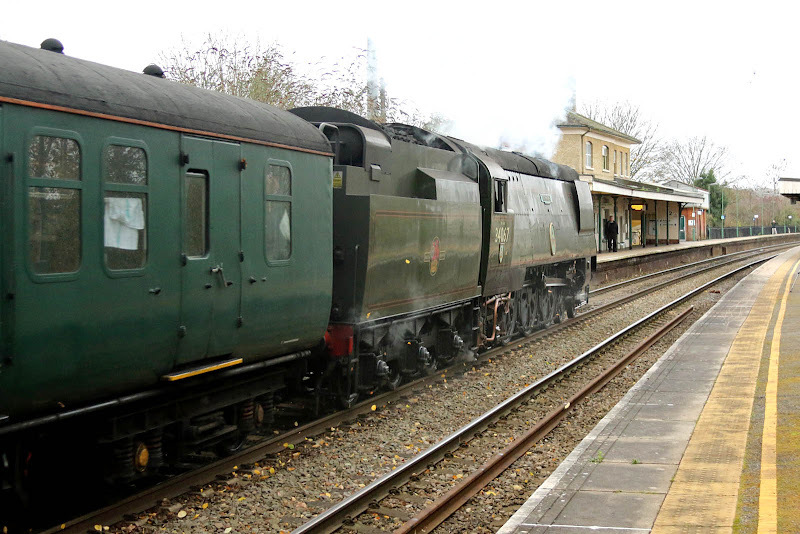 47832 returns "The Bath Christmas Market" through Romsey, 5th December, standing in for Tangmere. 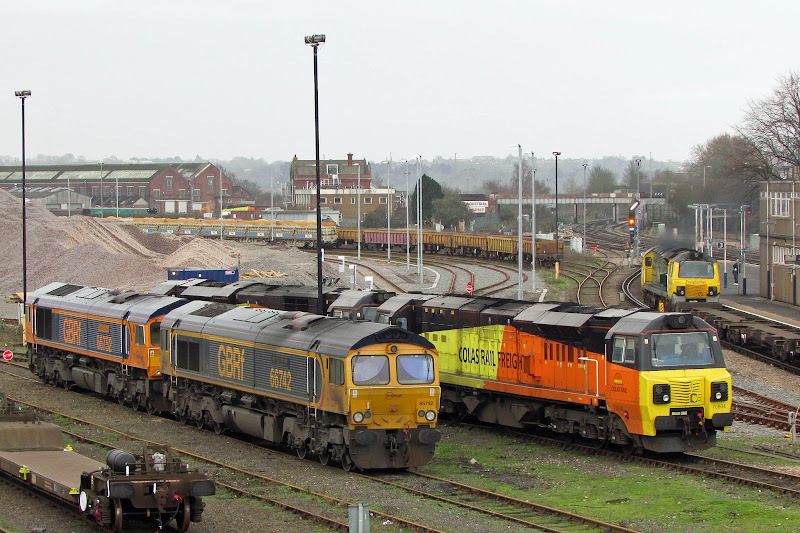 1Z80 07:54 Three Bridges - Bristol, 1Z81 16:35 Bristol - Three Bridges (47832 on return after 34067 was failed at Bristol St Philips Marsh - understood to be OTMR failure). 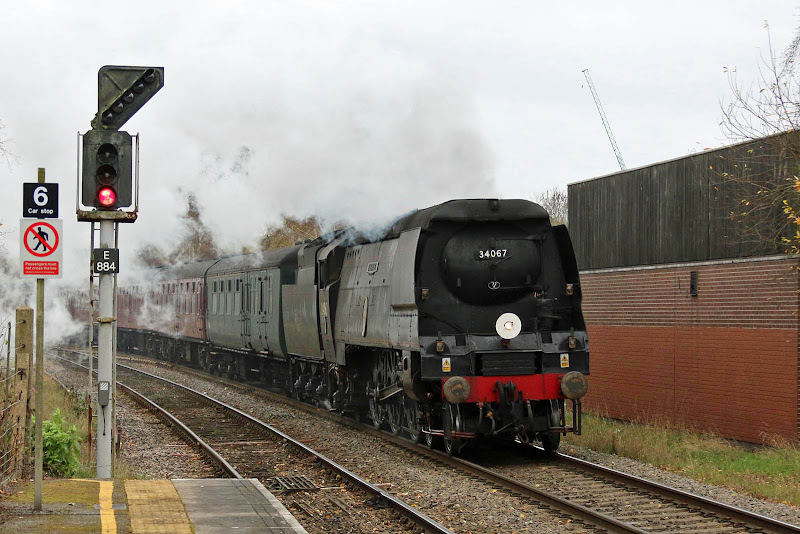 34067 Tangmere makes a return to steam after some weeks of maintenance. 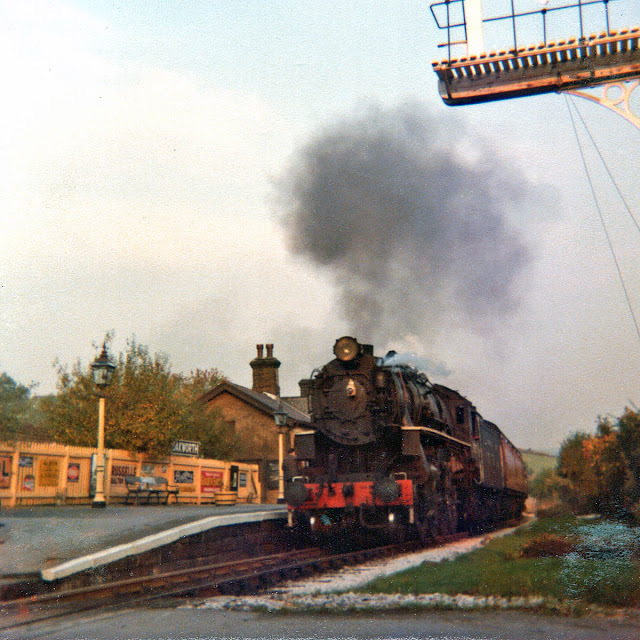 Arriving at Romsey, with 60116 Mountfield leading, which was built to Lot 30395 at Eastleigh in 1957, and with a long frame, was later Class 202. 60501 (Lot 30331, Eastleigh 1957) is built on a short frame. 60118 Tunbridge Wells, to same lot as 60116, tails unit 1001. A few minutes earlier at Redbridge. Image by Ian Knight. 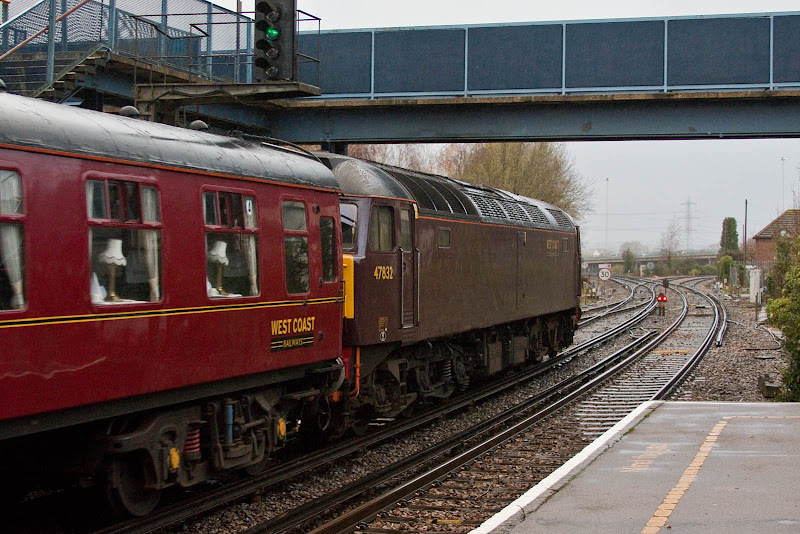 The return train at Romsey. 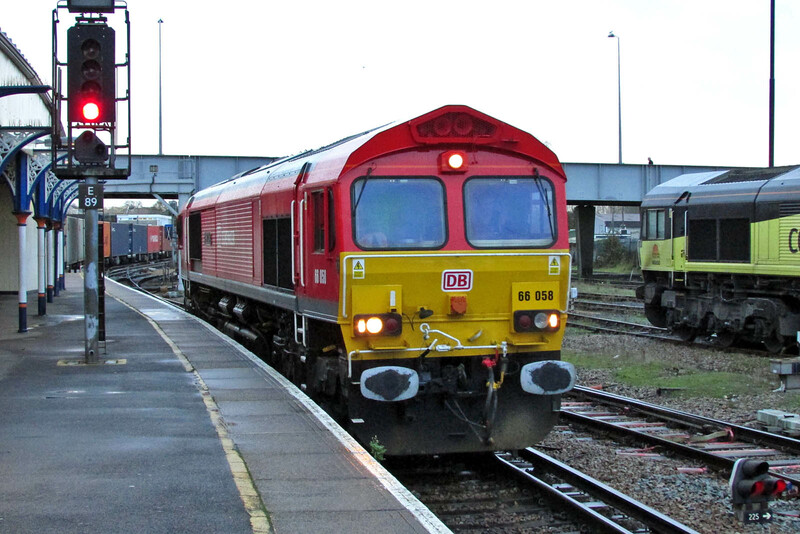 Again 6Oxx 16:37 Fairwater Yard - Petersfield, this time with a heavier consist, the MOBC (Medium Output Ballast Cleaner) and the BDT (Plasser NFS-D Ballast Distribution System Train), the latter being in the train last week. 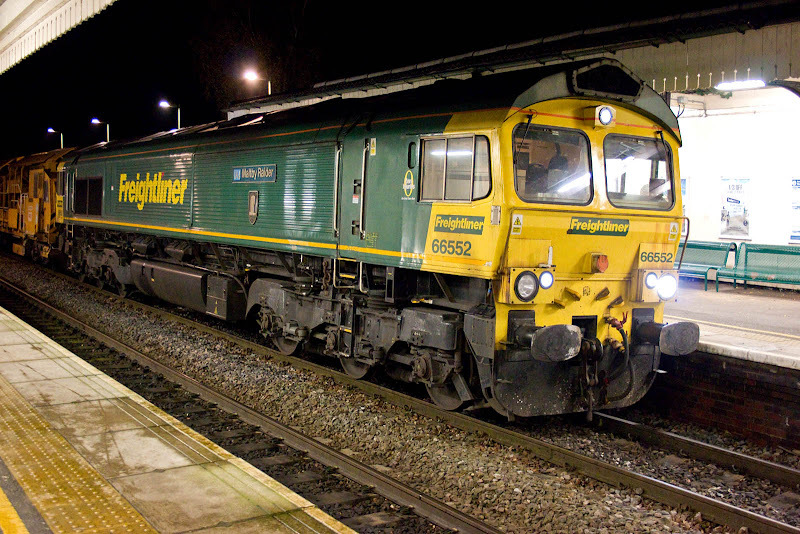 66523 led the train into Romsey. DR76324 is part of the MOBC. 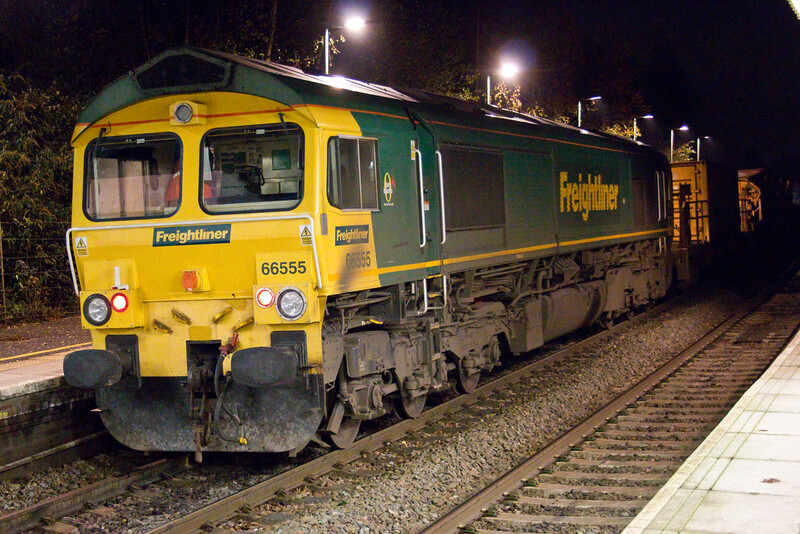 6 minutes later, 66555 was on the rear, as it was last time I saw the working. Unfortunately I could not use the brighter area of station lighting as there was a conflicting move in the platform. 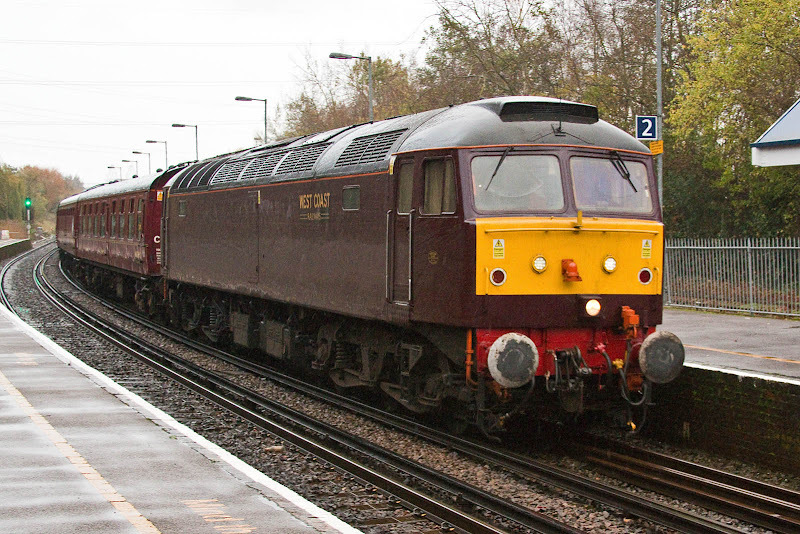 37602 leads "The Jolly Marketeer", arranged as top and tail from Salisbury to Portsmouth, Chichester and return. Only 37602 was working the train. 37602 was new as D6782 from Robert Stephenson & Hawthorns, Darlington on 29th November 1962, and was allocated to Hull Dairycoates. 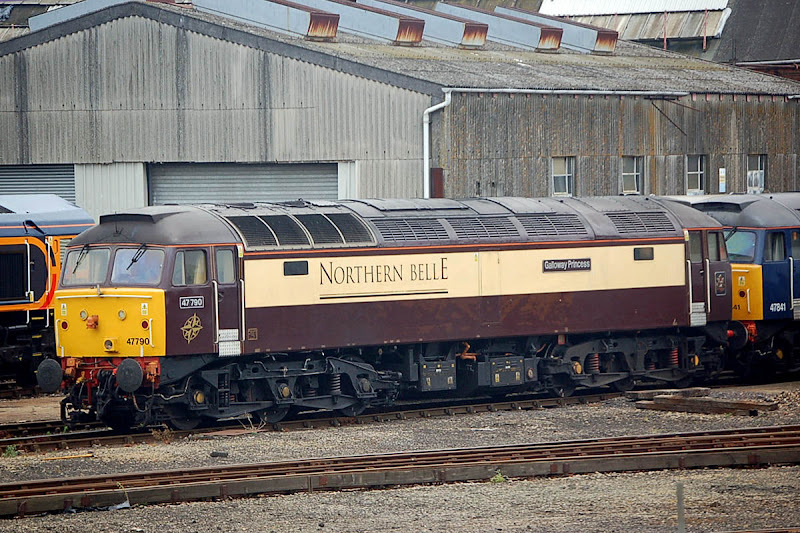 Renumbered to 37082 in February 1974, then heavy general overhaul and dual braked between August 1985 and March 1986 at Crewe, renumbered 37502. In February 1985 renumbered 37602 upon selection for European Passenger Services traffic which never materialised. To DRS from May 2002. BSK with generator 35469 and 37605. 37605 was new from Vulcan Foundry, Newton-le-Willows as D6736 in April 1962, allocated to Hull Dairycoates. Renumbered 37036 in March 1974, then heavy general overhaul and dual braked between Decemeber 1985 and April 1986 at Crewe, emerging as 37507. In October 1985 renumbered 37605 upon selection for European Passenger Services traffic which never materialised. 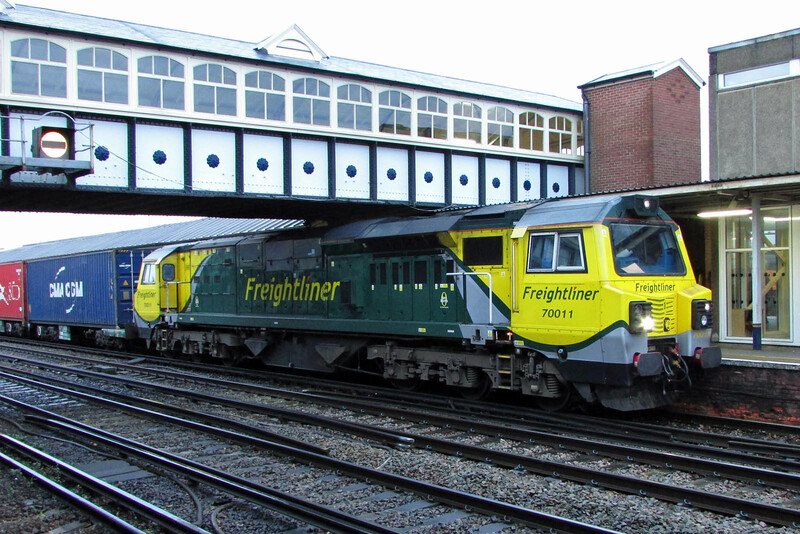 To DRS from May 2002, after some work for Freightliner in 2001, although it was in storage from 2009-12, for some of that time at Eastleigh Works. 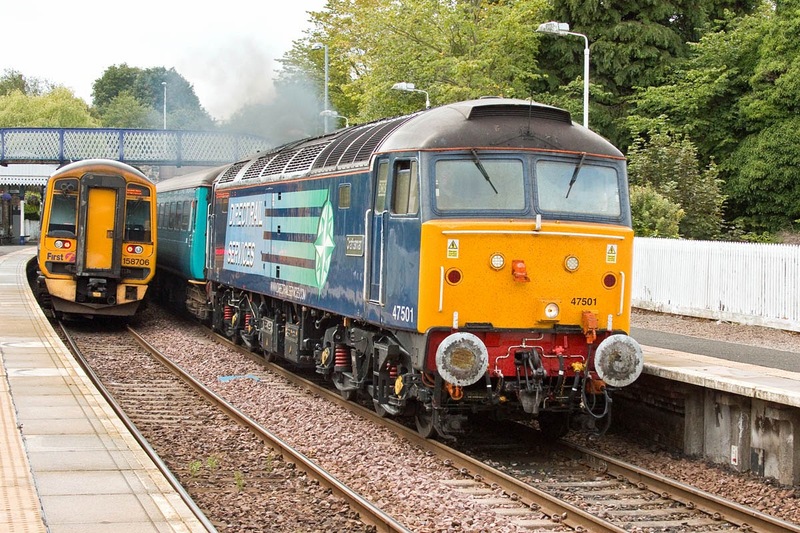 58008 at Eastleigh T&RSMD has been sold to Raxstar for disposal. 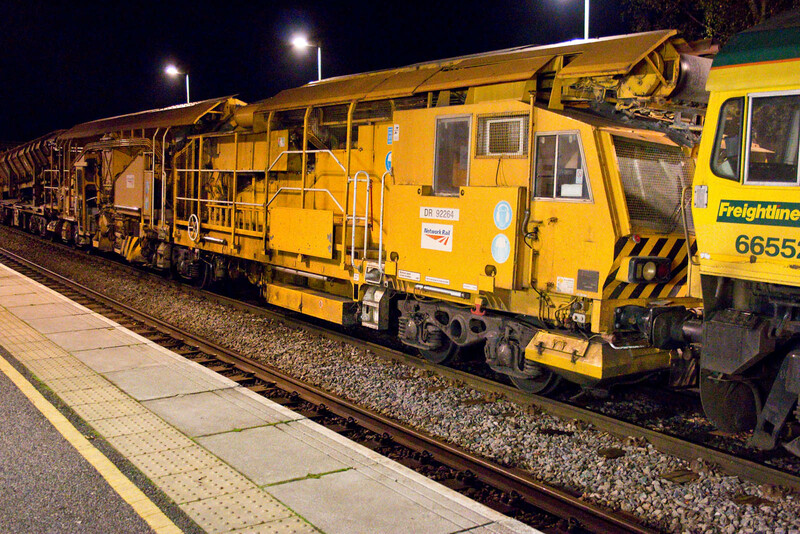 Raxstar are at Eastleigh Works, so this may only be a local transfer, if not cut up on site. 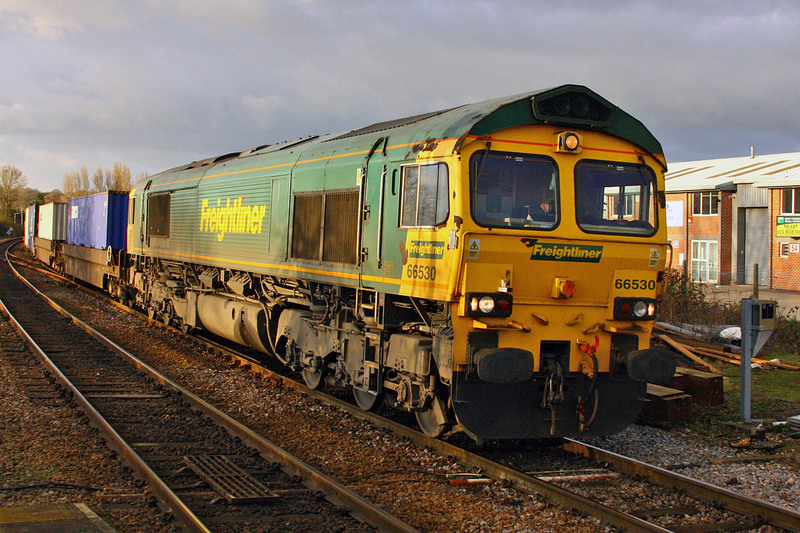 58008 worked for 16 years, and has been withdrawn for a further 16! 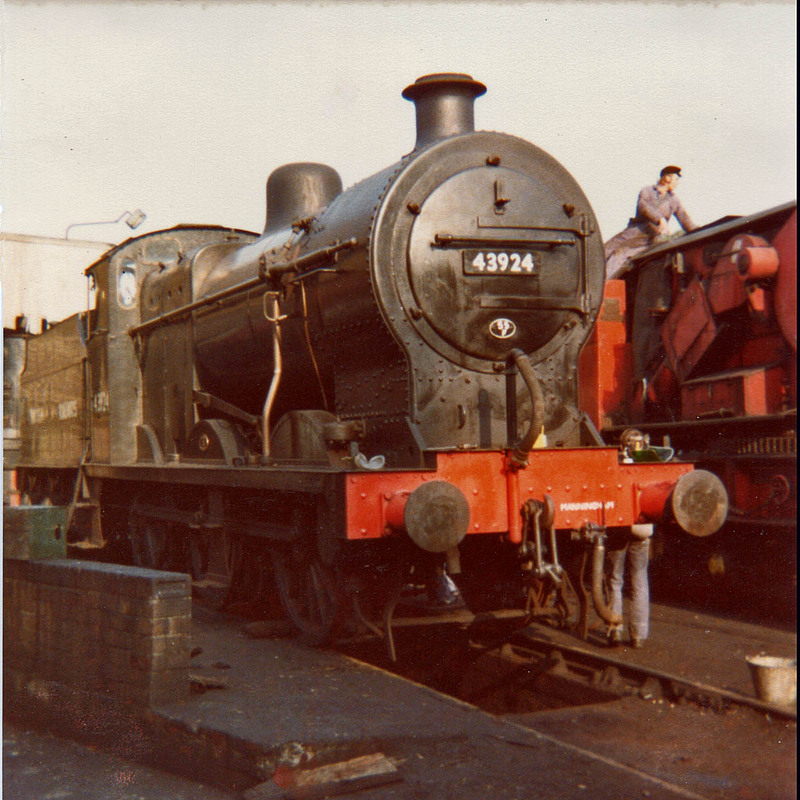 45407 The Lancashire Fusilier, built by Armstrong Whitworth at Scotswood Works, Newcastle in 1937. Very slightly further on. The train was moving at modest speed with an amber aspect to lead onto the Eastleigh line over the Sun Arch. 47832 (BR Crewe, August 1964) on the rear. The working is 6Oxx 16:37 Fairwater Yard - Petersfield, and apparently it has been running for some weeks, for engineering work on the Portsmouth Direct Line. 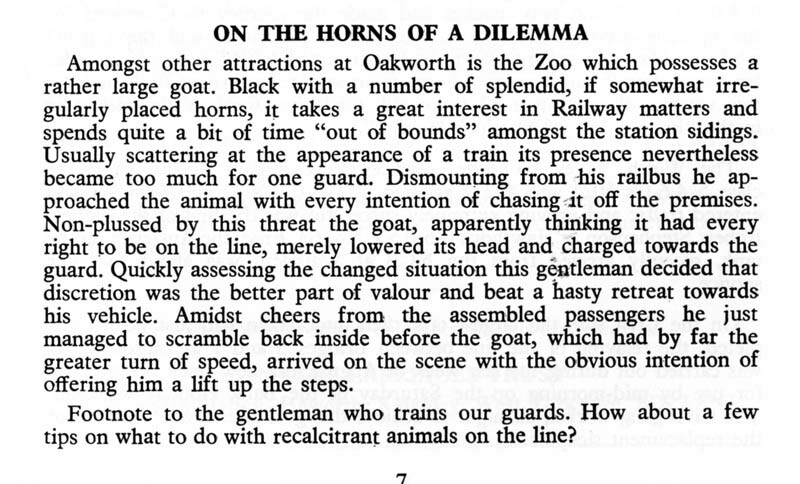 A crew change takes place at Romsey, firstly for the lead locomotive, and then, after pulling through the station, for the rear locomotive. Leading locomotive was 66552 Maltby Raider. 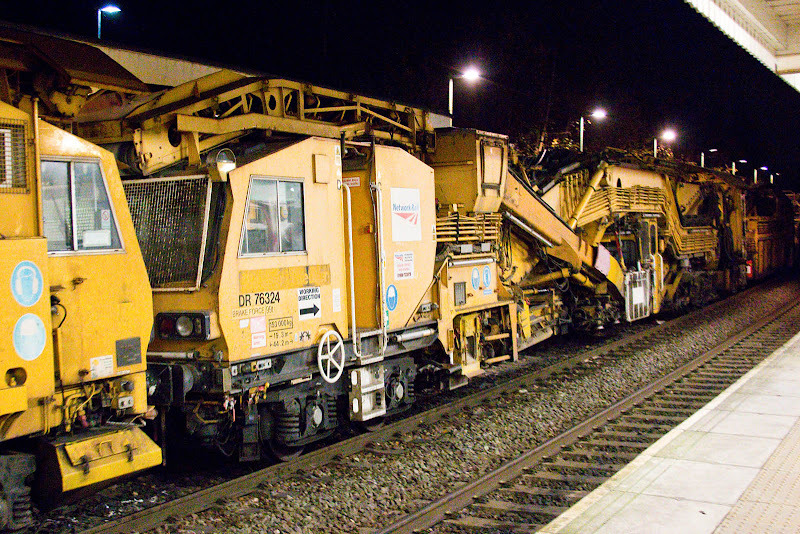 DR92264 a Plasser & Theurer NB-PW Ballast System Propulsion Machine. 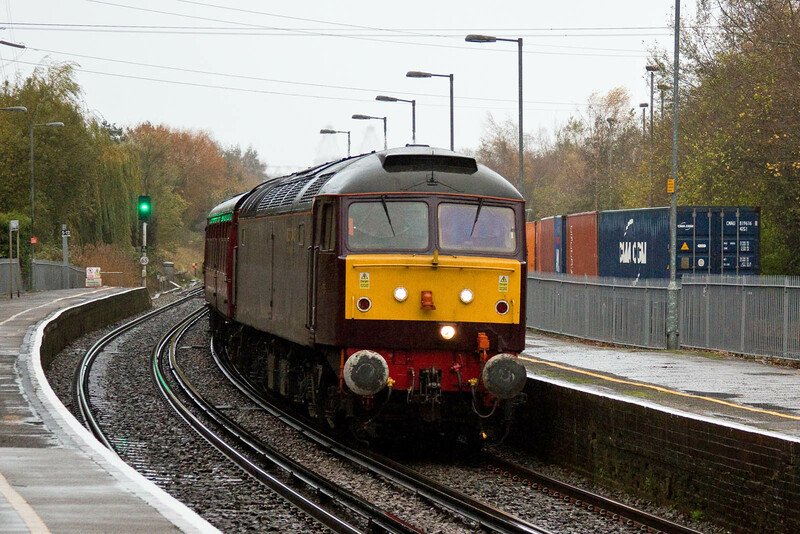 47832 leads through a rainy Redbridge. "West Coast Railways steam prohibited on main line network"
Today's ECS to Swanage ran with 47832 only. The train tomorrow is currently forecast to be steam on return only, with 45407 now in Bristol, and return schedule on OTT. A rather dark start at Eastleigh, just after 08:00, 70011 stops for crew change with 4O22 01:11 Trafford Park - Maritime. 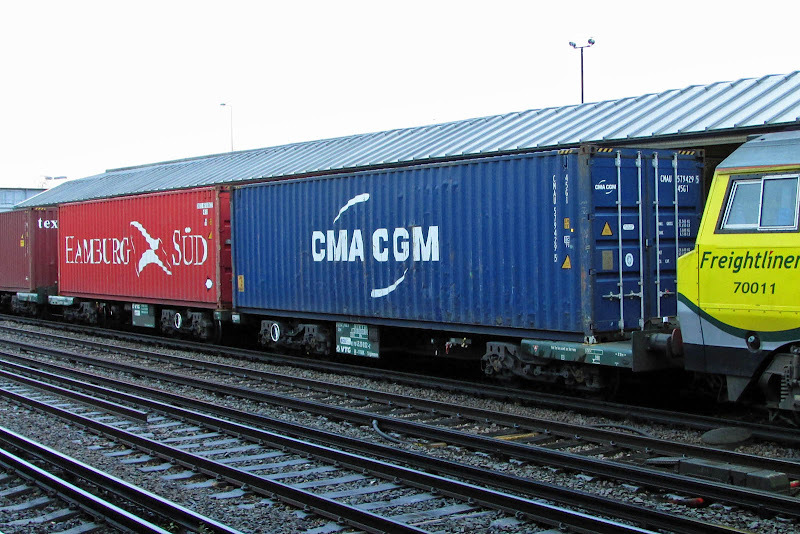 First flat was 8370 4520 022-2, one half of an Sfgkmmss Ecofret twin container flat owned by VTG and built in Poland by Greenbrier. 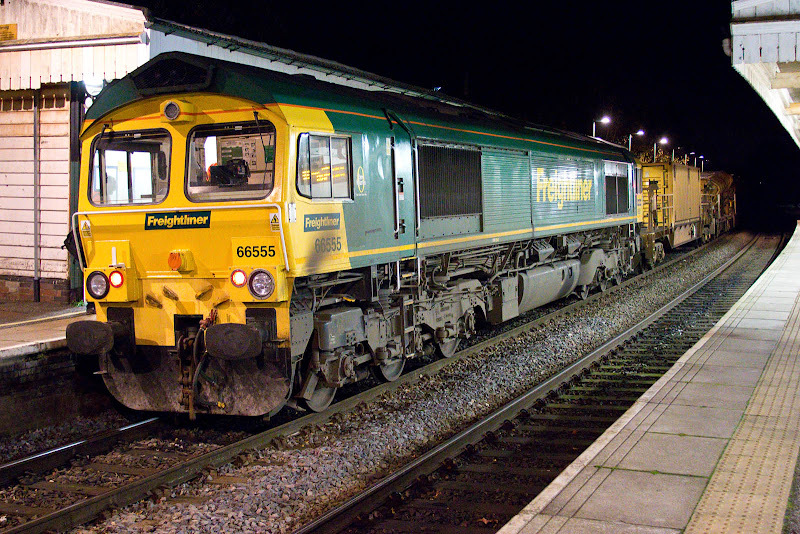 66058 makes a move from yard to the depot. It was repainted in August. I decided to go to the works anyway, and here is 73107 which was named Tracy on 29th August. ADB975974 Paschar (Hebrew for 'Angel of Vision) originally 1030 an RUO built to Lot 30647 at Wolverton in 1961.Taken out of traffic in 1979 and entered departmental service from May 1981, as a barrier for Class 313/315. This and 975978 are now understood to be in a lease to GBRf. ADB975878 Perpetiel - (Hebrew for 'Angel of Sucess') originally 1025 an RUO with the same build details. 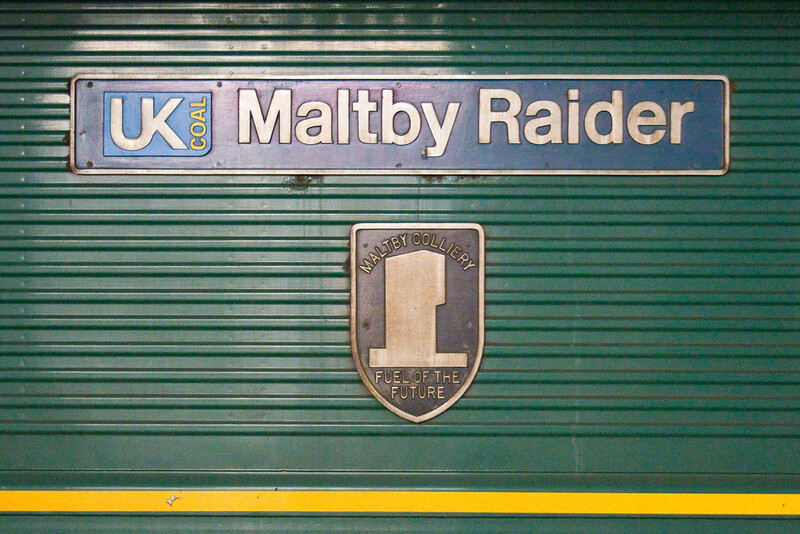 Taken out of traffic in 1979 and entered departmental service from August 1980, in similar barrier coach service. 66957 + 66610 0Y20 (?) 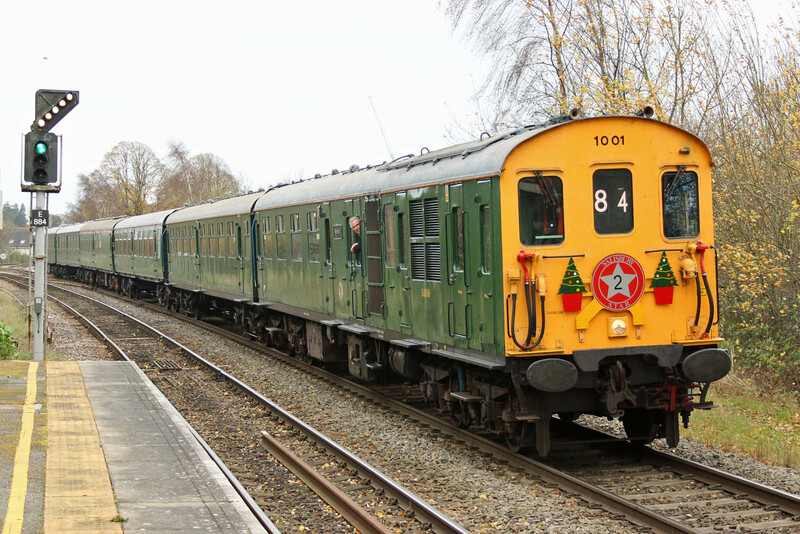 10:15 Stoke Gifford - Eastleigh, passing Romsey. 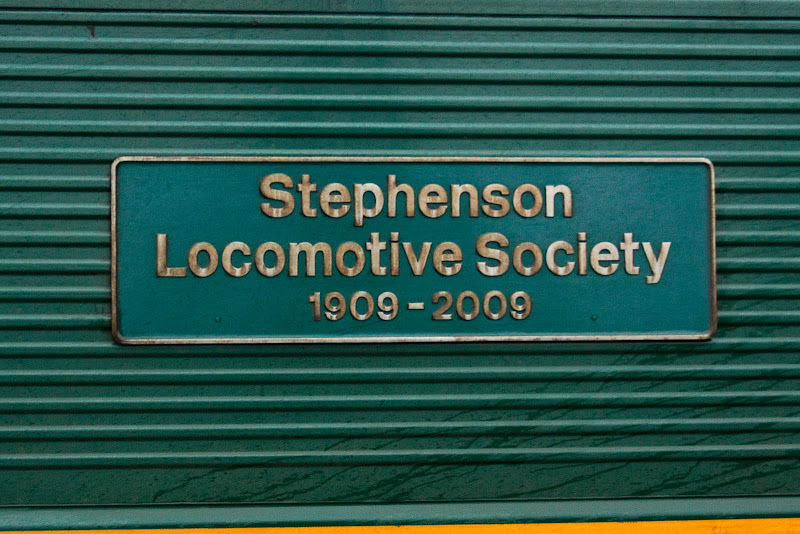 Stephenson Locomotive Society 1909-2009 nameplate of 66957. From a current viewpoint in 2015, looking back at these photos from 36 years ago, this clearly seems like another era, but with links to two recent 2015 visits and events covered in these pages. In those days there was an Edinburgh University Railway Society, which made visits to locations of railway interests on Wednesday afternoons. Nowadays an internet search and review of the list suggests that there is no similar society. Another society then were the Deviationists, which you may be relieved to know spent their energies on the Ffestiniog Railway - not that I was going to have the time to travel there and join in. Looking further afield, the railway societies at Durham and Oxford are similarly no more, but Cambridge continues. 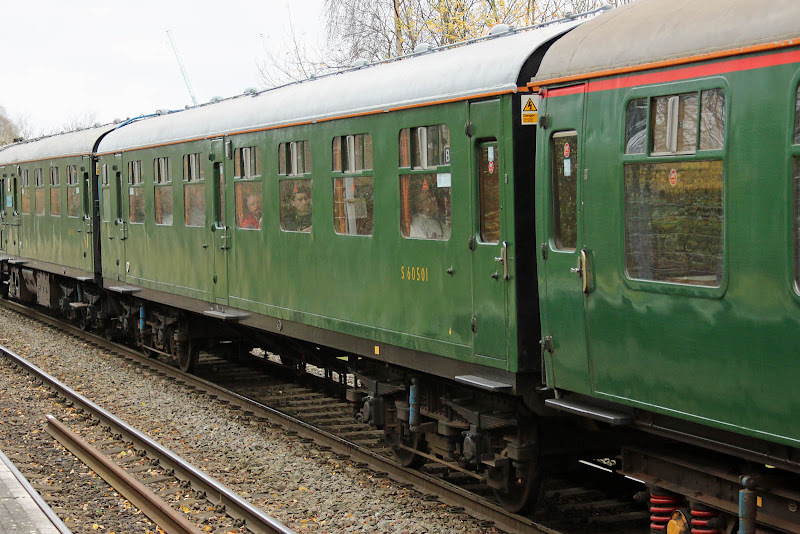 More adventurous for "Railsoc" were the Saturday tours, starting at an early hour, and heading on an extended day trip. Half-fare railcards at the ready! 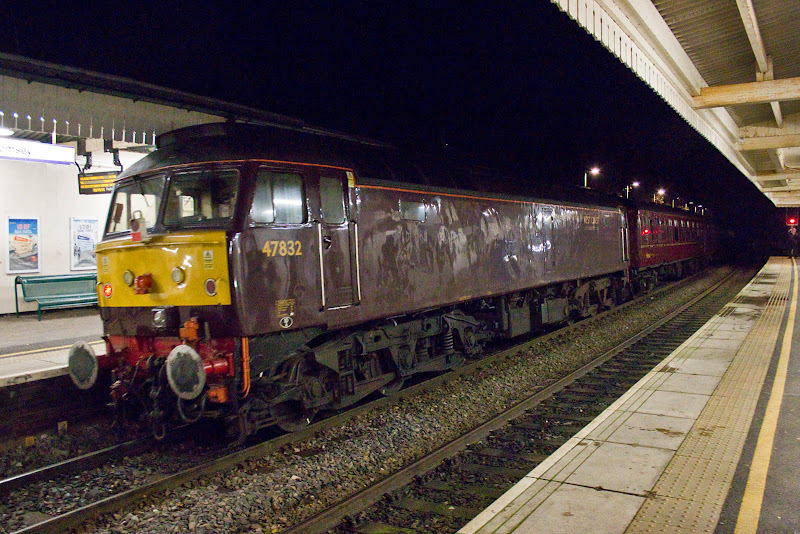 The first of these which I could attend was this trip to Keighley, which included my first travel by rail on the West Coast Main Line and Settle and Carlisle routes, As I recall it was a cold and dark start from Waverley, with frost on the sleepers around the Calders in early light. 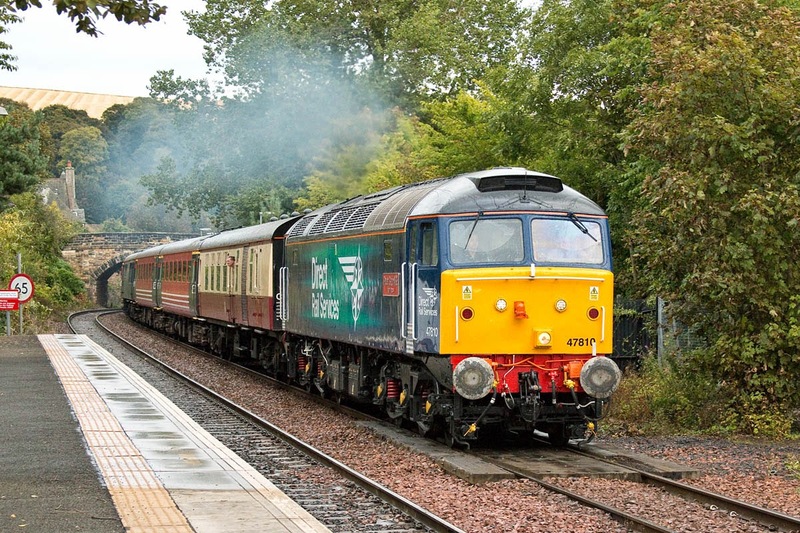 The first train locos were 47704 to Carstairs, then 87019. 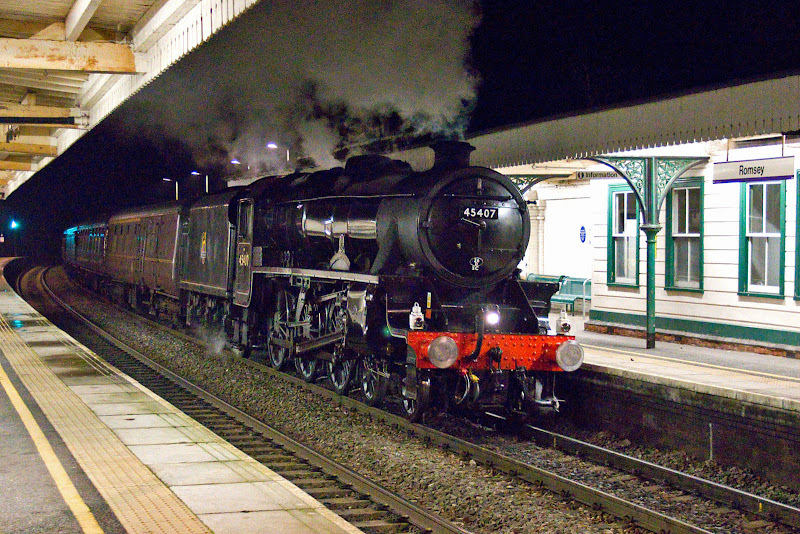 It must have been getting on for 10am by the time we got to Appleby, now hauled by 47533. 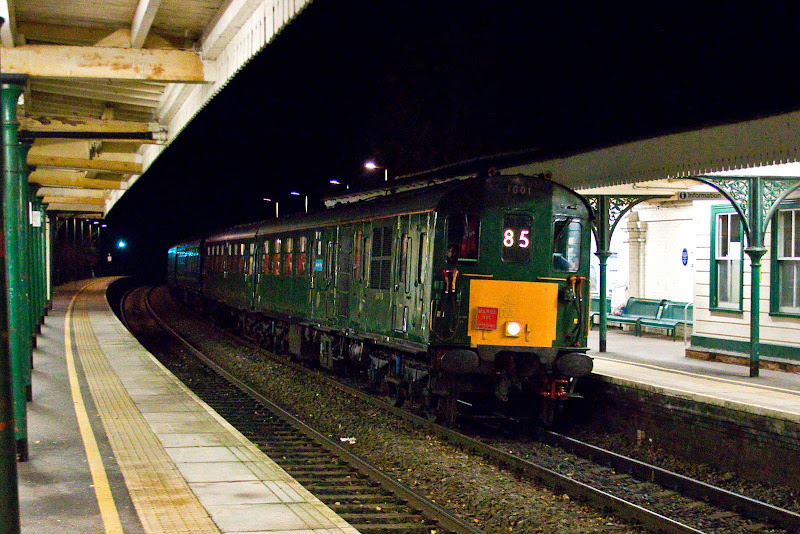 The service we were using was a Carlisle (or Glasgow) to Nottingham train, one of three trains a day of this pattern, which were withdrawn in 1982 in an attempt to run the line down for closure, but that was in the future and the S&C had more recently celebrated its centenary in 1976. These trains only called at Appleby and Settle, the other stations only saw recreational and occasional Saturday Dales Rail services. I believe that my motivation for taking the picture were the first example of S&C architecture seen, the then recent events for Bishop Treacy, and a previous visit made in 1973. Compare with my 2013 visit. 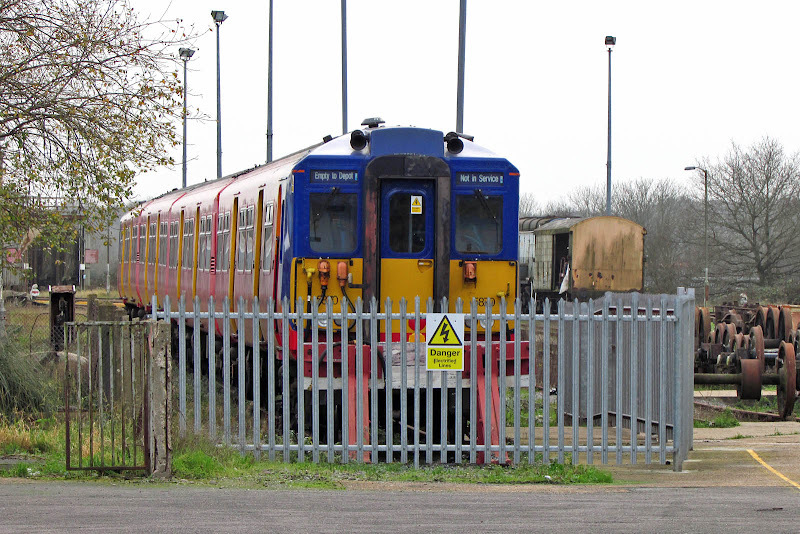 Waggon und Maschinenbau railbus 79964 ("DRB 64") is seen at much the same place as here on 3rd October 2015. 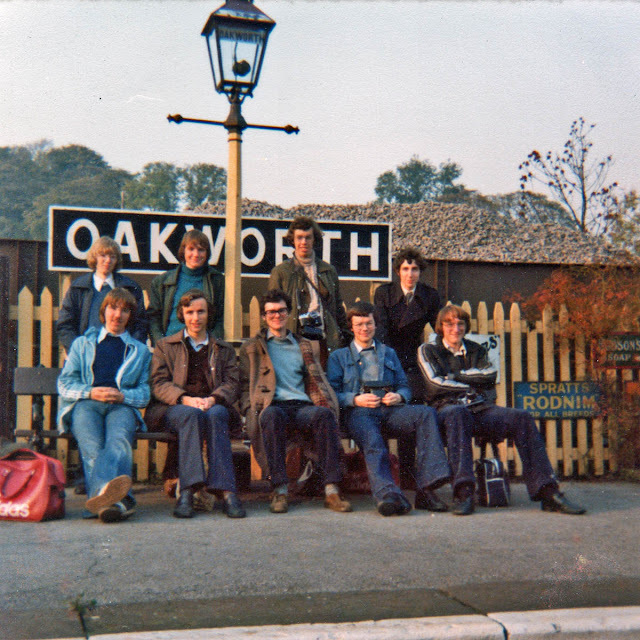 Various Railway Society members are seen on the platform. I believe that we chose to dismiss the charms of the railbus, and wait for the first steam train of the day - I cannot see the detail of this timetable. Beyond the station, the mill chimney appears to be that adjacent to the Midland Railway yard, now demolished and replaced by an Asda. When the steam train came, it was USA Transportation Corps S160 2-8-0 5820 Big Jim, then recently restored to traffic, following an import from then communist Poland. I must admit to being rather disappointed, as I was hoping for a UK main line locomotive, since coming from Scotland, I had only experienced 60009 and 46464 for steam haulage to that date. 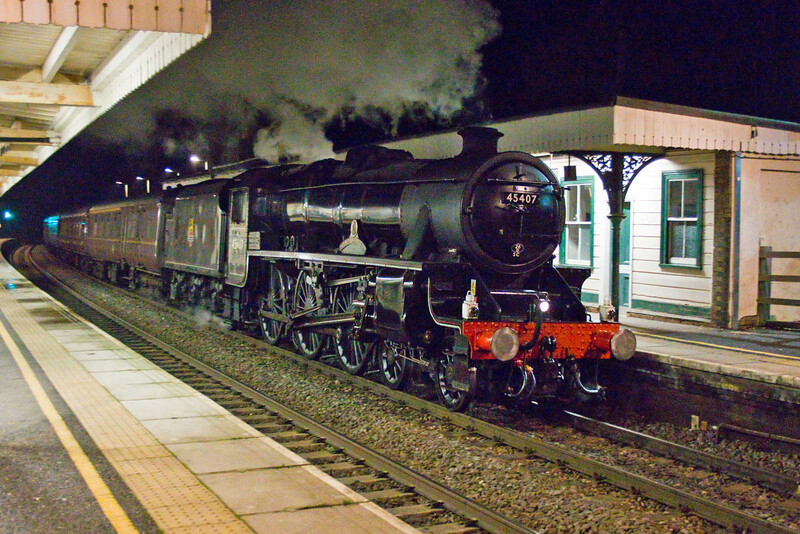 Big Jim is seen on the run around at Keighley - built by Lima, works number 8758 of 1945, and later Tr203.474 in Poland. It was moved to the UK in November 1977, and used in the filming of 'Yanks' in 1978. The buildings beyond the railway station have all subsequently been cleared, and are now occupied by the Keighley campus of Leeds City College. Our train progressed to Damems Loop where we crossed D0226 on a permanent way train. 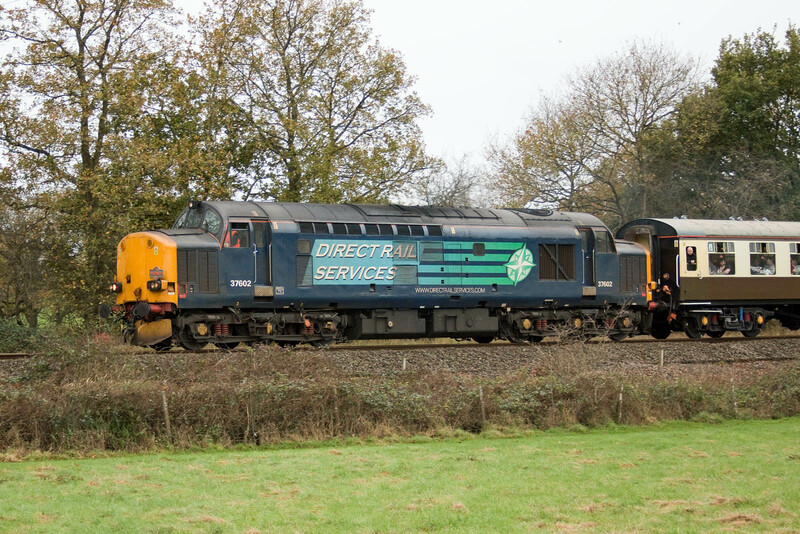 The concept of a preserved diesel locomotive was pretty novel to me at that time. 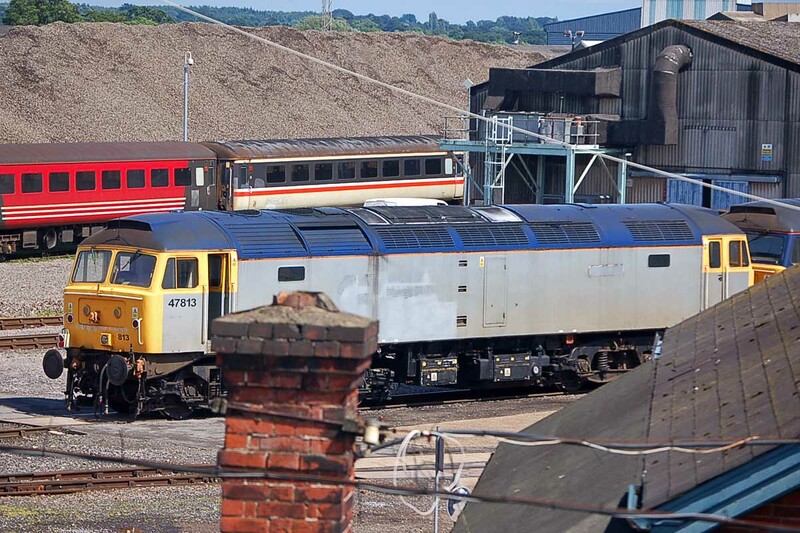 One of my fellow Railsoc members, Ken, is touting an SLR for his version of this scene. Upon arrival at Oakworth, children run to join the train - they will be in their early to mid-40s now. LMS 3F 0-6-0T 47279 (Vulcan Foundry, 1924) was an only an arrival of two months from Barry Scrapyard. 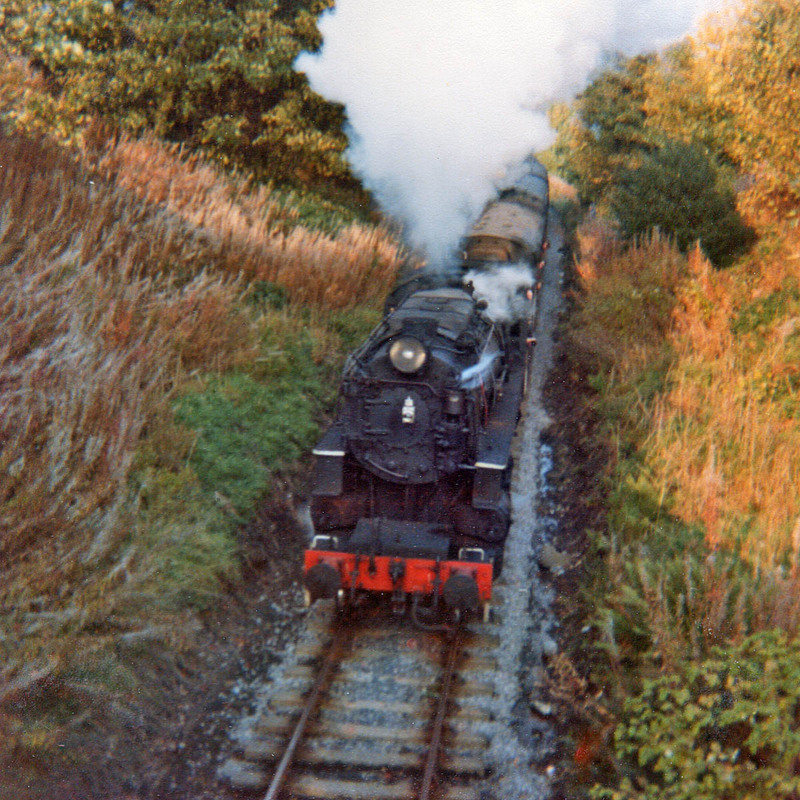 We later returned to Oakworth and examined the locomotive which was missing many parts - it looked to my eyes like an impossible task, but it was restored to traffic in 1988, and has run through two periods in traffic, most recently coming out of service in 2011 and currently awaiting overhaul in the museum at Oxenhope. The telephone poles seem here have subsequently been removed, although pole routes exist elsewhere on the line. 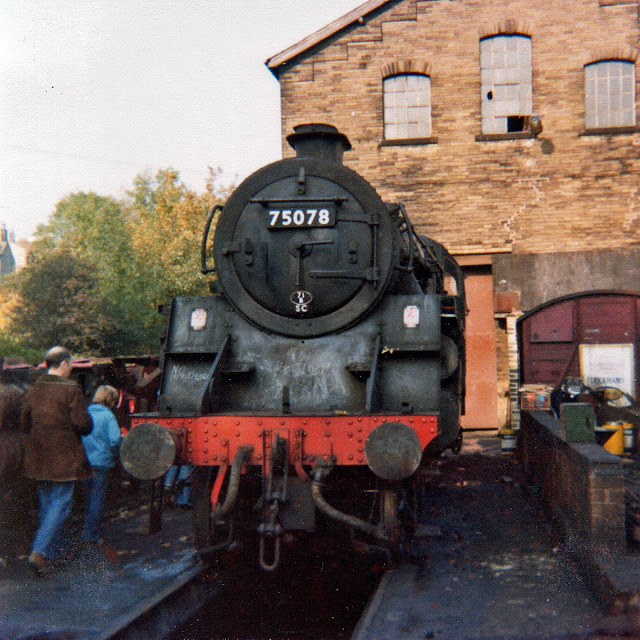 BR 4MT 4-6-0 75078 in the shed yard at Haworth. marked 'No Handbrake', This was a Southern Region locomotive, built at Swindon in 1956, so was only 23 years old at this time! 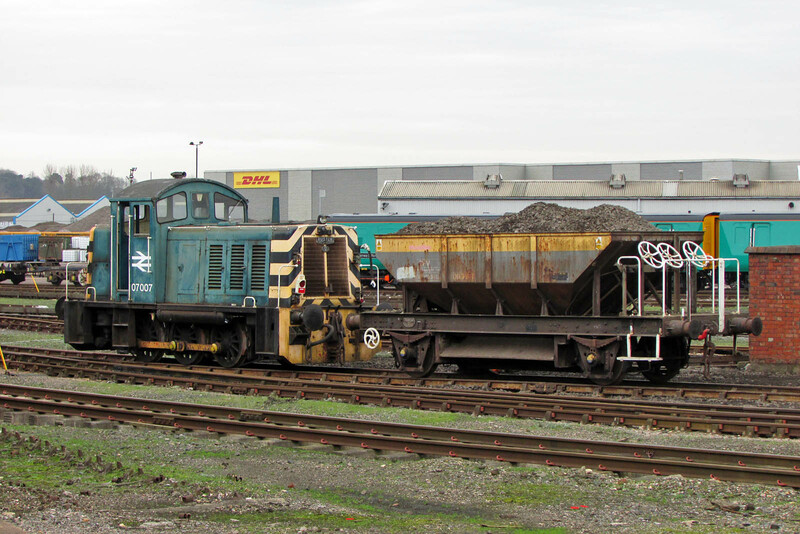 Ultimately allocated to Eastleigh from May 1965 until withdrawal in July 1966 and removal to Barry scrapyard. Rescued from the scrapyard in 1972 and returned to traffic in 1977. 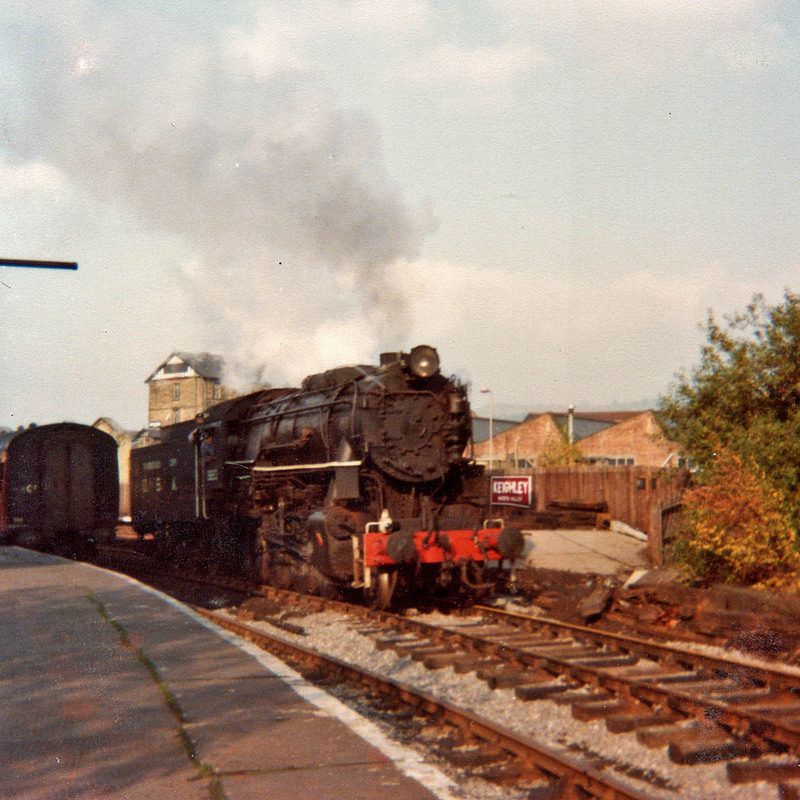 At this time, the locomotive was still running with its BR boiler tubes. Now through its third KWVR overhaul, and returned to traffic in 2015. The board on the right promotes Duckham's Lubricants. 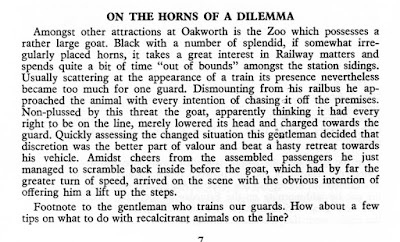 In those days, visitors could responsibly wander around the locomotive shed area. All the locomotives seen were first sightings for the class, many also on the main line, and also my first familiarity with engines restored from Barry scrapyard. LMS 8F 8431 was built by the GWR at Swindon in 1944, and was allocated to the Western Region from 1955 until withdrawal in 1964. 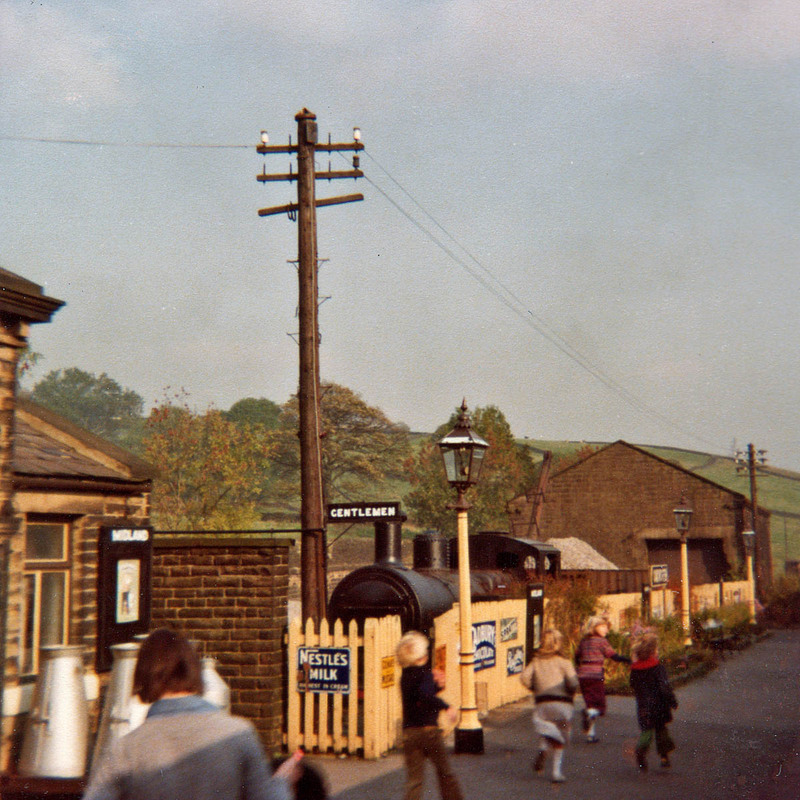 Removed from Barry to the Worth Valley in 1972, it was returned to traffic in 1975. At this time in 1979 8431 had recently received repairs for a frame fracture. It last worked in 2000 and is currently in the museum at Oxenhope. LMS 2MT 2-6-2T 41241 in red livery is a Worth Valley stalwart, It was built at BR Crewe in 1949 and allocated to the Western Region. 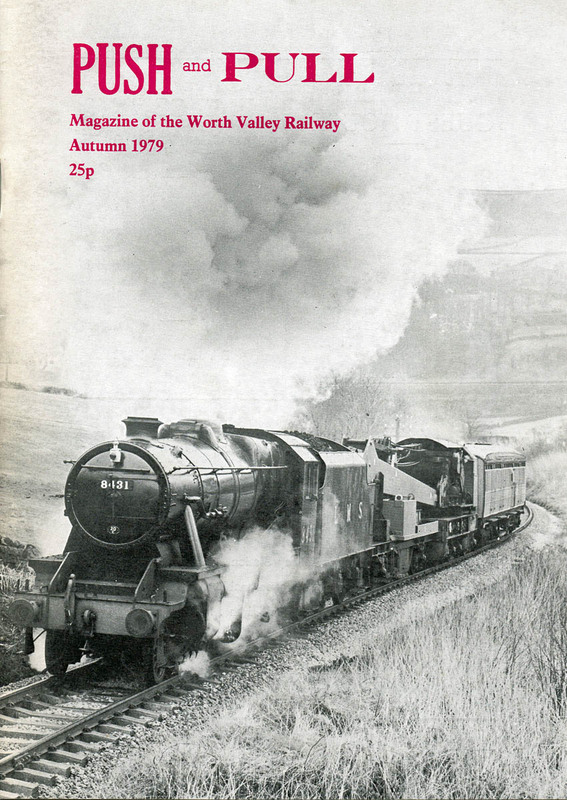 In 1965 it was allocated to Skipton, and it is said it was worked to Keighley each day to work the Worth Valley turns, but the branch was by then closed, so the locomotive was kept idle there. 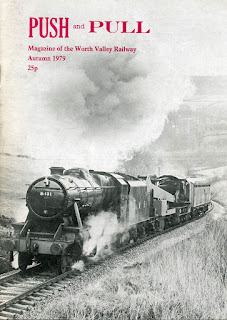 Purchased from Skipton and delivered to the Worth Valley in March 1967, where it hauled the re-opening train in 1968. In January 1977 the boiler was lifted, a new bottom plate fitted to the smokebox, repairs made to the firebox, and when seen it was awaiting new large flue tubes. Reassembly took place place through 1978 and 1979, with new water tanks, cab side sheets and bunker. The locomotive was repainted black when returned to traffic. Currently 41241 is under overhaul at Haworth ahead of the 50th anniversary events in 2018. In a poor example of preparing my shot, my briefcase is seen in the foreground (it was all I had then, a backpack would have been a better idea, but not on a student budget). Midland Railway 4F 0-6-0 43924 constructed at Derby in October 1920, so at the time of this visit was 59 years old, It was the first locomotive to be recovered from Barry scrapyard, in September 1968, and was restored to steam in 1974. At this time the locomotive was running with superheater elements taken from 'Crab' 42765. 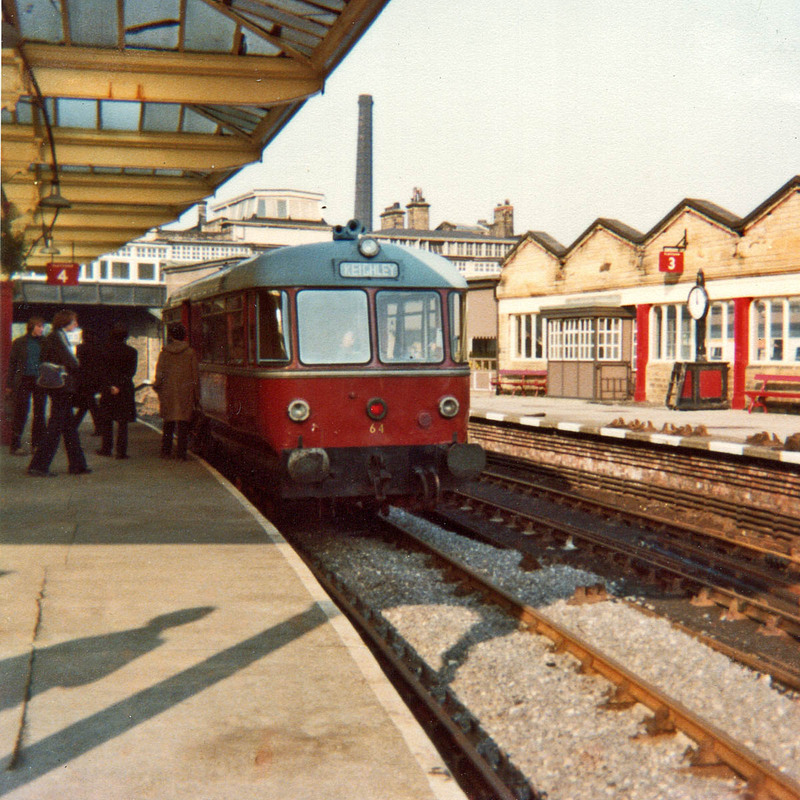 The 55F shedplate is for Manningham, as also spelt out on the bufferbeam, a former Midland Railway Bradford shed, hence local to the location. Currently again in traffic. The crane receiving attention on the right has caused me some puzzling, as those on the railway today were delivered later. I have 1976 and 1981 dated stock books from this first and a later second visit, and the latter says that Cowan Sheldon 30 ton crane RS1087/30 of 1960 was acquired from BR at Longsight. 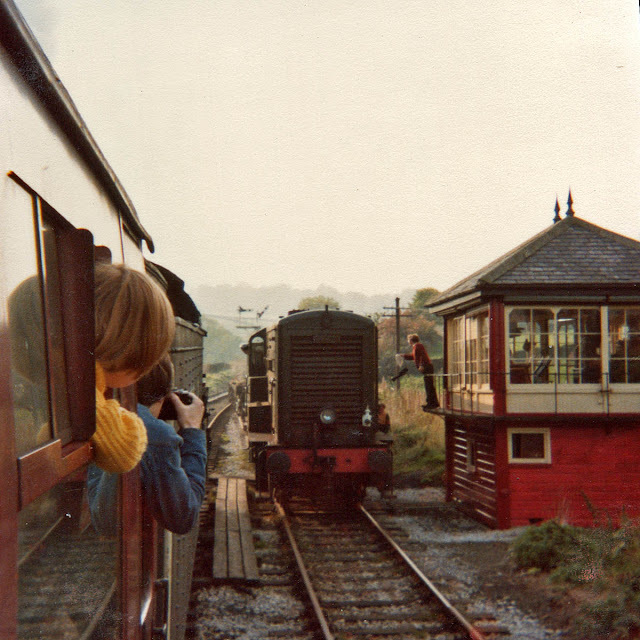 It moved on in 1983 to the Severn Valley Railway. Big Jim is seen heading up the valley at the Ebor Lane bridge. It appears that we must have walked from Haworth to Oakworth, although I have no recollection of this - just that we had some time to spare at Oakworth later. We appear to have arrived at Oakworth for another view of 5820 on an uphill train. We would be waiting here for the return train to Keighley. Edinburgh University Railsoc on tour. Unfortunately I remember very few names. On upper left was John (Hayes? ), and next to him I think was James (?) Frisby. 2nd from right in the front row was Ken. If any of you are out there and reading this, my email is below. A motley collection of bags, including two marked 'Adidas'. I can just recall 5820 steaming into Oakworth for the return to Keighley. 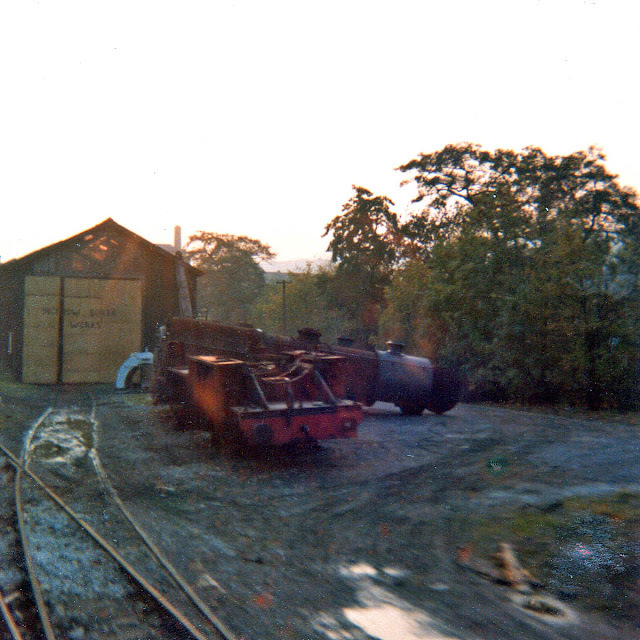 Ingrow was not an operating station in those days, there being no building there at that time. It did house the 'Ingrow Boiler Works', as seen here from the passing train, The boiler and frames are those of Hughes Fowler 'Crab' 42765, the recent star visitor to the Watercress Line Autumn Steam Gala, restoration being completed on the East Lancashire Railway some years later. 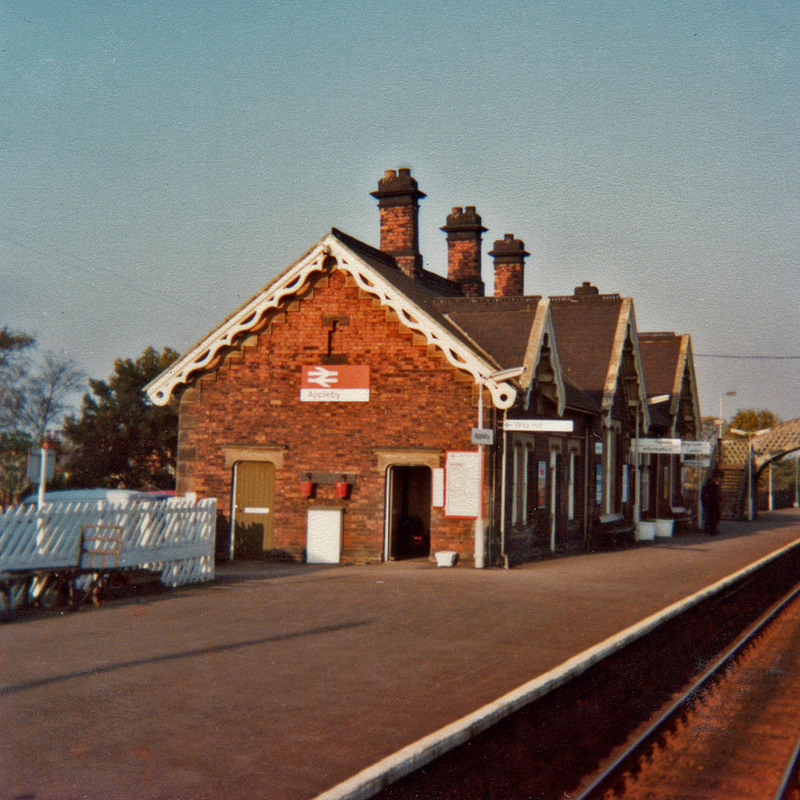 Delivery to Ingrow was in 1978 and restoration activity was "being undertaken privately"through 1979 with an emphasis on the boiler, while the tender was located at Southport. 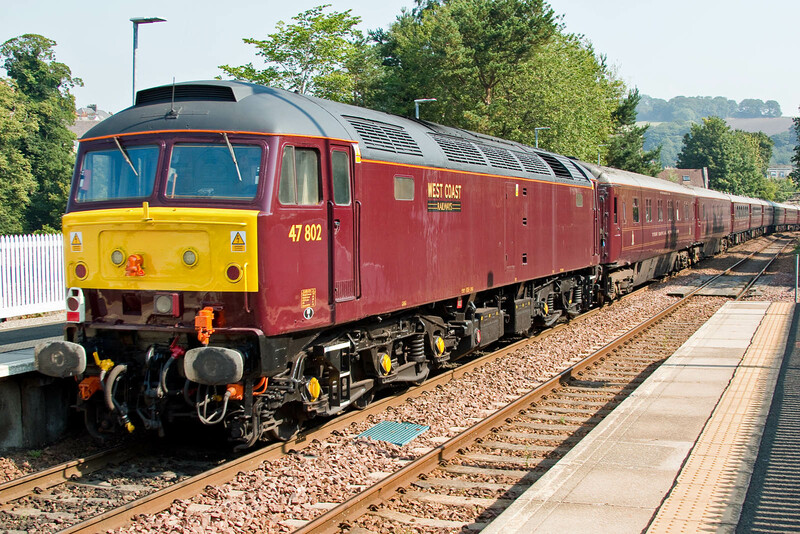 We would soon be in Keighley for the return trains - firstly to Skipton, then to change onto a train for the S&C. While at Skipton, 55016 Gordon Highlander passed on a tour. This was the L.C.G.B. 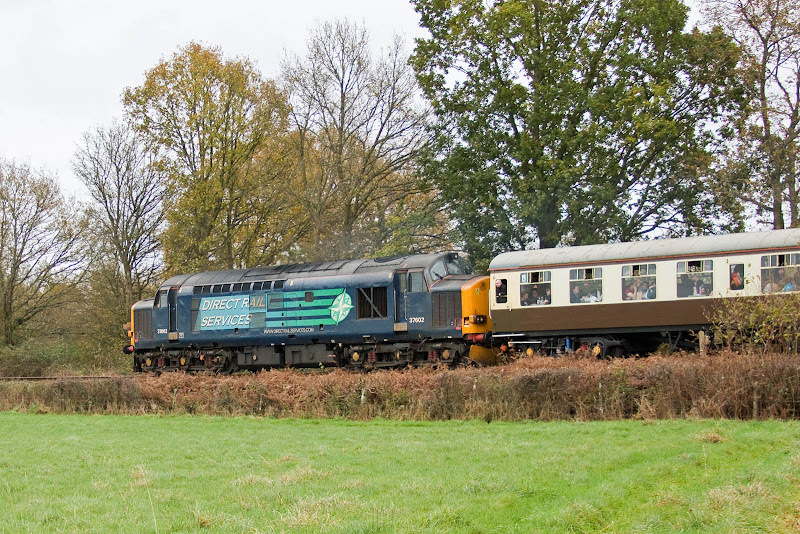 Deltic Discoverer Rail Tour, which I believe that we passed somewhere around Ais Gill when it was northbound (more info: one two three four five six). The return over the S&C was in the dark, although I recall leaving the lights of Settle behind while climbing uphill, and the noise from the loco through Blea Moor tunnel, although until consulting my notes had no recollection that it was 45003. My spotting list for the day follows - many less numbers from after dark on the return. 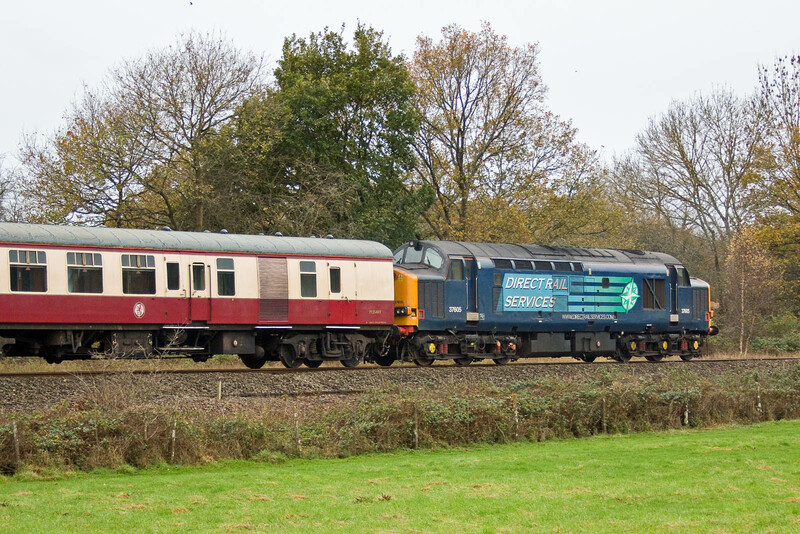 The number of scrappings in the late 1980s and early 1990s representing a step change from this era of a nationalised multi-service railway, with much local variation, on a scale which could not be perceived on that day in 1979 - when it looked like Sulzer Type 2's and 4's would be forever. The front cover of the Autumn 1979 edition of 'Push & Pull', magazine as obtained on this visit. Printed by Crown Press (Keighley) Limited, Chapel Lane, Keighley.